Now that last week has alerted everyone to look for last minute changes on the blog, there will be no last minute changes this week. 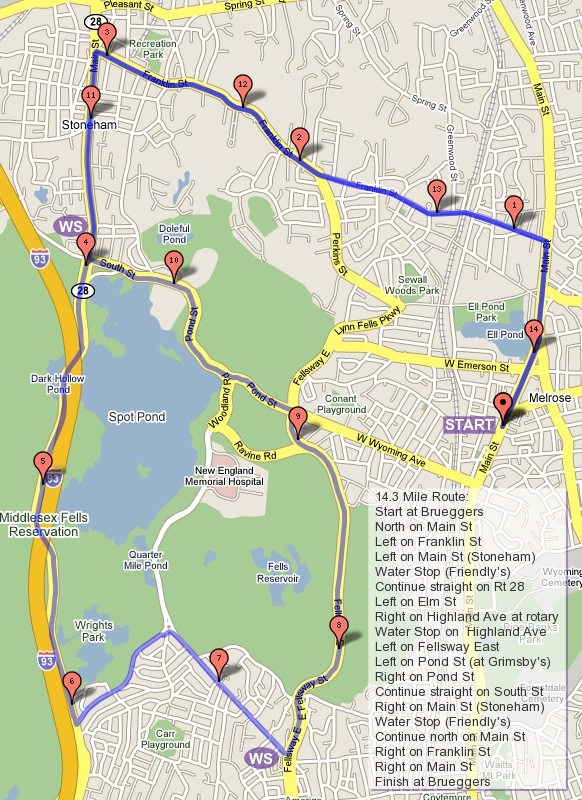 The running routes are 14.6 miles and 7.1 miles. For the most part they follow the same route as 2 weeks ago along the old Melrose Half Marathon route, with a little extra done up front. It’ll be a chilly start but overall a nice day to run. Hopefully the sun gets rid of some of the ice on the sidewalks to help us get our run in safely. In trying to think of a word to describe those that headed out on the road this morning Popsicles were the only thing to come to mind. And in trying to think of how to make that into a title for this post I researched Popsicles and found that “If it’s Popsicle, it’s possible” is their slogan (Note to Popsicle marketing department, I’ve never heard this phrase before in my life!). Today it wasPopsicley, and a few showed that it was in fact possible to run in this weather. Ok, back to business… If you’re reading this you probably ran on Saturday when the weather was 20 degrees warmer, or you just heard about this blog this morning when I explained to you how everyone else shifted their run to Saturday. Today’s small group was Jose, Christina, John Kelley, John Mulroy, and Whitney. First let me apologize to Whitney who was there mainly to help with the water stop, something I asked her to do two weeks ago, and in the flurry of reorganizing runs over the weekend and trying to make sure people had some support out there on their long runs I forgot to e-mail her back. She woke up early and headed out in the freezing morning air just to keep her commitment of helping with the water stop. Thank you so much Whitney, sorry I dropped the ball on that. With the word that she wasn’t needed for the water stop Whitney packed up and headed home content to get back to her studies and avoid a run in the 10 degree air (smart move!). JohnK, Christina, and Jose started their run up the frozen tundra of Main St towards Wakefield while JohnM took a ride to Wakefield to join in the run at mile 3 and run the last 7.7 miles with the group. My daughter Lizzie (yup, she assisted me again today) and I got a hot chocolate and a coffee, absorbed as much of Brueggers heat as we could, and drove along the route with John to the Dunkin Donuts parking lot in Wakefield. We spotted the frozen gang of three right after the Greenwood area chugging along at a nice clip. In Wakefield, John poured a few cups of water out of the water stop bucket in my trunk as Lizzie and I put on layer after layer to help get us through the few minutes in the cold. Earlier Christina asked how I would recap a run I wasn’t going to be running and I assured her I would gleen some stroy out of the few minutes at the water stop… here it is: One of the plastic cups John poured water in had been squished and a split had opened up on the side. We didn’t know this until Christina tried to drink from it and it leaked like some prank cup all over her. We quickly dried her up so she didn’t get frozen in place, which was a real possibility since the tiny puddle on the asphalt where she spilled instantly turned into a thick sheet of ice, it was that cold this morning! Seeing the red blotches forming on my face from my allergic reaction to the cold, the group decided one water stop was enough for the day. They headed up to the loop around the lake while Lizzie and I headed to Dunkins for a loop around a donut. We drove back to Melrose along Main St where the four would soon be headed to finish up their run. I hope you had a good one, now go find somewhere warm to thaw out! For those that ran today, be it our little band of long runners or those who headed to Derry for a cold challenging 16 miler, kudos to you for braving the elements. When feeling comes back to your finger tips, fill us in on the details of your run! Sue and Joanne had set out at 8:30 with Ginny and Nancy. They ran to the church at Lake Quannapowitt and returned before Lizzie and I had headed out in the car. Ginny and Nancy did the same run with a loop of the lake and we caught them on their return trip about 2 miles from the finish. Both passed on a water break having planted a little something along the way to get them by. Ginny did say that Lizzie’s bright sunny face and big waves did refuel her state of mind though, making the last few miles easier. The report was that some of the sidewalks were manageable, they were forced out into the streets in places and most of the way around the lake, and Saturday drivers aren’t nearly as forgiving as Sunday drivers. The wind was in their face all the way out to the lake and to their back on the return trip, although swirling winds did surprise them at times. Lizzie and I had a bagel and coffee with them as 11:00 approached, when Ed and Walt headed out for their turn. We played a game of Penguin Pile-up, wasting time until 12:00 when the next crew came in: Carol, Lois, Demi, Peter, and Pam. These 5 headed out and we made our way to the car, driving out to the Dunkin Donuts intersection in Wakefield. After a few Walt and Ed stopped in for some Gatorade for their last three miles, and a few minutes later the group of 5 pulled in after completing their first three miles. We packed up the water stop while they headed off to the lake. I hope everyone had a good strong pre-artic conditions run. I plan on being at Brueggers at 8AM to greet anyone heading out into the bitter cold. I hope to be able to provide a water stop too, weather permitting. I think the group will be small though, if it exists at all. Week 4 – One word: C-O-L-D! I know, I know… I’ve said a few times already this training period that I wouldn’t ask you to do something I wouldn’t be willing to do myself. Well this Sunday’s run will pose an interesting challenge. Those who have run with me have heard me mention Cold Urticaria, a condition where one’s body has a histamine reaction to cold air, and how it’s been effecting my winter running. This Sunday is predicted to be dramatically colder than even the cold Sundays we’ve had so far, with temperatures in the single digits for the entire run and wind chills below 0. For that reason I won’t be running this Sunday (I did my long run along the hills of Newton with Nick earlier today thoguh). Should you be running? That’s up to you. Cold air makes for harder breathing and tighter muscles, but if you prepare for it shouldn’t cause any harm. Some are talking about running tomorrow afternoon instead to beat the cold. If that’s your intention and you don’t want to go it alone, I suggest you post your plans here and see if anyone wants to join you. If there is a big enough group running locally at a certain time we can try to provide the water stops for you. This is the Roll Call, let me know what your plans are for this weekends run! As for my long run today, a brief recap. Nick and I met around 10:45 this morning on Beacon St in Newton, near Rte 16. In an attempt to take advantage of what was predicted to be a day close to 40 degrees, and an area with hills that Nick needs to be prepared for, we headed out along Beacon St to Rte 16 and the Boston Marathon course. The biggest obstacle of the day was work day traffic, cars and trucks hugging the snow banks on the side of the road leaving little room for a pair of runners to run. We made our way out to Comm Ave without incident and took advantage of the safety of the Commonwealth Ave carriage road, for the most part protected from traffic as we ascended the hills. A quick stop at the Newton Public Library for a sip of water and we were back at it, through Heartbreak Hill and down to the BC campus. The thought in my head through these miles was “this is a lot easier than when you start in Hopkington!” Following the course into Cleveland Circle we turned right on Beacon St, opposite of the marathon route. Along the Chestnut Hill Reservoir we wound our way to the opposite side of the campus and then cut along College Rd back to Comm Ave. Back through the hills the thought in my mind was about mile markers, and how our 12 mile run wasn’t adding up in my head. We reached the Newton Fire Station where we picked up the pace for the last two miles. Traffic was not cooperating though and repeated trips over snow banks to ice sidewalks and return trips over snowbanks to bare streets impeded the quick return. Turning off of Rte 16 and back onto Beacon St signalled the last mile, a surprising uphill mile. Thinking Nick was on my tail I kept the swift pace up ending our 12 mile run strong. Nick’s wife met up with me in the parking lot and we talked for a minute before she finally had to ask what I had done with Nick. On cue he turned the corner with a strong finish of his own. Now that its done I’ve hit mapmyrun.com to get a better idea of what we did today… I get 14 miles on my map Nick, I guess we’re ahead of schedule now! This Sunday we awoke to about 3 inches of snow on the ground and heavy snow falling with much more to follow. Even in a snowstorm 13 runners made there way to Brueggers for the Sunday Long Run. We reviewed the routes and the many options that could be taken along the way to tailor the distance to your willingness to endure the elements. Demi took the first option, and I’m sure there were many more that made the same decision in absentia, her run was across Main St to the Melrose YMCA for a jaunt on the treadmill. The rest of us headed out in the storm up Main St to West Wyoming. In an attempt to keep track of people the best I could I started out at the front of the pack running with a new visitor to the Sunday Long Run, John. John is a strong runner with years of experience, a self-professed “thick Irishman” who would not give up his space along the side of the road while I kept moving from roadside to sidewalk trying to figure out where I felt safest. There was enough snow on the sidewalk to cover our shoetops, with unsure footing underneath from choppy ice from last week’s storm hidden underneath. The roadside was slushy snow, much more manageable for a runner but not so much for a car as the plows were just making there way out into the storm. At Grimsby’s we picked up Lois who had braved the storm, driving all the way from New Hampshire, but arrived a little late. She hopped in to the pack and followed us to the Fellsway East hills. Here’s where things got interesting. John pulled ahead having the advantage of his superior speed and his Yak Trax. Brian Gilroy caught up to me as we ascended the second long hill of this stretch. Coming down the hill was an old man in a big car who thought it necessary to let out a succession of beeps to let us know that an icy road in the middle of the snow storm was no place for a runner, but apparently is the right place for an old man with an attitude. All of us were aware of him now as he passed the frint pack and stopped beeping. A second later he passed the middle pack and beeped beeped beeped a little more furiously. Then again as he passed the back of the back. The Mad Beeper had introduced himself to the Sunday Long Run group, I sure hope our new friend made his way to his very important destination. We turned at the rotary at Highland Ave, greated the guy under his tent selling newspapers who seemed completely unphased by the weather, and headed up to water stop 1 where Rick would be waiting for us. The effects of trying to accompany John began to take its toll, and with snow accumulating on my glasses, John and Brian faded into the snowy distance even quicker. Ed pulled up next to me and as we dodged the parade of plows intent on clearing out the complete width of Highland Ave we hoped in out of snowbanks all the way to the water stop. I stayed at the water stop to make sure all runners arrived safely and headed out to their next destination correctly. Brian and Ed left as another John and Ginny pulled in. And another John, BarryC, Christina, and Jose followed in behind them. A plow stopped in the middle of the street and asked “Can I ask you guys a question? How many of you are out here? What race is this?”, about a dozen, not a race. “Then what are you people doing out here!!!”. He laughed at us as he pulled away, which was much more pleasant than the plow driver coming the other way who made it obvious he resented us being in the streets, slowing down his progress, delaying his late morning of sitting under a bridge somewhere in his plow. The rule of the day seemed to be that if your name was John you headed down Woodland Ave to run 7 miles for the day, otherwise you turned left on Elm to loop the backside of Spot Pond. As they headed out Suzanne, Lois and Pam pulled in. Liz pulled up to let us know she would not be running today, being on the saner side of the crazy runner line. With everyone accounted for we Suzanne, Lois, Pam and I headed down Elm St while Rick moved the water stop over to the Stone Zoo parking lot. Somewhere on Elm St a muscular guy in a cutoff t-shirt shoveled his driveway. I didn’t see him, but according to Ginny he was quite a sight. To keep warm I set off ahead of this pack up Slacker’s Hill towards the Sheepfold. I could see the footprints from the pack ahead of us and could tell I was getting closer to them as the prints became more defined. Heading over Rte 93 and through the South St parking lot of Spot Pond I could see Barry, Jose, and Christina, plus the argyle pattern of Ginny’s Yak Tracks were well defined in the snow so I knew she wasn’t much further ahead. I caught the three as we headed toward the zoo, where Ginny was already sipping Gatordade with Rick. I let them head out ahead of me while I waited to see that the rest of the runners were coming, again with the intention of catching up to them at some point. The stretch from the zoo to the hockey rink, runners were forced out into the street. About 7 inches of snow had accumulated on the sidewalks, and although they were runnable, our wet sneakers were starting to make our feet too cold. Lois and Pam headed back down Pond St by Grimsbys for about an 8 mile run, the rest pushed forward to the hockey rink. A pack of plows cleared the opposite side of the road so I headed up there to run, where I could see the expressions on people’s faces when they spotted the crazy snow covered runner coming at them. Turning up North Border Rd Rick pulled over to offer more water. I was more concerned that he might be stuck in the snow bank than my own hydration, but all was ok. Back onto the hills of the Fellsway East where an elderly woman panicked at the sight of runners in the road and slammed on her brakes on the downhill, sending her skidding into the path ahead of the runners. Luckily she was well ahead of us and nobody was hurt. She drove about 1 MPH after that until all runners had passed her. Back past Grimsbys some chose to turn down Wyoming to bring the adventure to a slighty quicker end. Ginny, Jose, Christina, and I formed a pack of four making our way to the Melrose Middle School knoll for our last water stop. Rick was quite a trooper dealing with the snow storm to keep us hydrated. With Gatorade fueling our last mile we headed up to Main St.
Ginny and I pulled ahead on Main St, running on the side of the road. Suddenly we heard a big bang behind us. Peaking back I saw a plow heading down the street. A few seconds later I heard the big bang again, this time right over my shoulder. This is when I realized these were on purpose, a signal to us runners that we were about to get scooped up by a massive plow blade. Hopping over a large snow bank into the foot of fluffy snow on the side walk we found safety as the big plow scraped the side of the street. Pulling into Brueggers, a snowy mess, our 12.5 miles were done. Brian came in having added extra miles on for about 16, wearing a bushy mustache seemingly made completely of ice. With frosen hair, sweaty icicles, soaked clothed and soggy sneakers, 13 of us made it through what hopefully was the messiest long run of this winter… but it is still early in the season. I told everyone they could add 10% to the distance they had run today, the degree of difficulty warranted it.